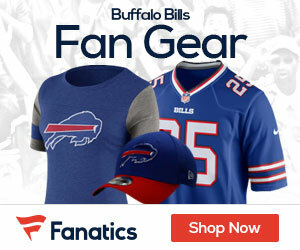 The Buffalo Bills bring their 3-0 record into Paul Brown Stadium today against the 1-2 Cincinnati Bengals. Since starting last season 0-8, the Bills have seven of their past 11 games and haven’t lost to the Bengals since the 1988 AFC Championship game. On the Buffalo side of things, for the most part the names have remained the same. Ryan Fitzpatrick has a choke hold on the starting quarterback job. Fred Jackson has performed as the one of the top running backs in the NFL. Steve Johnson has settled in quite nicely as the team’s No.1 wide receiver with a touchdown catch in each of Buffalo’s three games. As far as Cincinnati goes, they’ve gone in a very different direction. Carson Palmer opted for retirement rather than returning under center as the Bengals starting quarterback. Top cornerback Jonathan Joseph bolted for Houston as a free agent. Chad Ochocinco and Terrell Owens have also departed. The keys to the car now belong to a pair of rookies, Andy Dalton and A.J. Green with Cedric Benson still riding shot gun. Let’s take a look at some of the in-game matchups between the Bills and Bengals that could decide the outcome of today’s game. WR Steve Johnson vs. CB Nate Clements. Buffalo’s top wide out and Ryan Fitzpatrick’s favorite target, Johnson is off to a good start in 2011 hauling 20 catches for 256 yards and three touchdowns. Johnson has scored a touchdown in every game of the season. In 2010, Johnson torched Cincinnati for 137 yards and a career-high three touchdowns. It’s up to the former Bill, Nate Clements, to contain Johnson. Clements spent the first six seasons of his career with the Bills and the former Ohio State product had 26 interceptions ( five returned for TDs) with the Bills before signing a lucrative deal with San Francisco after the 2007 season. This is Clements’ first season with the Bengals and ranks fourth on the team in tackles with 14 through three games. CB Drayton Florence vs. WR A.J. Green. Experience against youth. Buffalo’s best against Cincinnati’s best. Florence has taken over as the Bills’ top cornerback, and with the Bills hurting at the corner position with both Terrence McGee and rookie Aaron Williams hurting, Buffalo is thin at corner. That means a lot is going to fall on Florence, and also Leodis McKelvin. Florence will have to rely on his physicality and veteran experience against the rookie. He’ll be giving up four inches to Green, who stands 6’4 and is beginning to gel nicely with fellow rookie, QB Andy Dalton. Green has 14 catches in the past two games and leads the Bengals with two touchdowns. Last year, Florence had an interception returned for touchdown at Cincinnati. Last week, he picked off Tom Brady and returned it in the fourth quarter for a touchdown to give the Bills their first lead of the game. The Bills will need similar big plays from Florence on Sunday. RB Fred Jackson vs. Bengals run defense. The firestarter for Buffalo’s offense, Jackson has run with purpose and fire through the first three games of the season. He’s carried the mail 47 times for 303 rushing yards and 3 rushing touchdowns. He’s got 115 receiving yards on eight receptions out of the backfield. His 6.4 yards per carry average is tied with Oakland’s Darren McFadden for best in the NFL. But Cincinnati’s run defense has been up to the challenge. The Bengals rank seventh in the NFL allowing just 88 yards per game on the ground. Denver’s Willis McGahee went off in Week 2 with 131 yards rushing, but other than that not much has been generated from opposing rushing attacks. Cleveland rushed for just 83 total yards while San Francisco managed on 50 total rushing yards. The Bengals have held top backs Peyton Hillis and Frank Gore to 97 combined rushing yards. LB Shawne Merriman vs. OT Andre Whitworth. We continue to wait for Merriman to have that breakout performance for the Bills. Largely through three games, Merriman has been relatively silent. That might change this week and so could Buffalo’s defensive gameplan. The Bills stuck with rushing four to the quarterback and have blitzed sparingly, in large part because Oakland’s offensive scheme was run heavy with Darren McFadden and New England’s Tom Brady will pick you apart blitzes or not. That’s resulted in just two sacks from the Bills. Merriman still remains Buffalo’s best bet to get after the quarterback, and against rookie QB Andy Dalton now figures to be a real good time to unleash the dogs. Whitworth, however, won’t make it easy for Merriman. He gets the most out his size and talent, and hasn’t yielded a sack through three games. RB Cedric Benson vs. Bills run defense. With a rookie quarterback in Dalton, and an apparent suspension possibly beginning after this week, we can expect Cincinnati to give a heavy workload to Benson. He rushed for 121 yards on 25 carries and a rushing TD on opening day, but hasn’t reached 20 carries or gained more than 64 yards in either of the Bengals’ last two games. So, it seems that the 20-carry mark is the magic number so far this season. When Benson has receiving 20 or more carries, the Bengals win. Buffalo’s run defense has ran the early season gauntlet against top runners Jamal Charles and Darren McFadden, and BenJarvis Green-Ellis. They held Charles to 56 yards. McFadden totaled 143 combined yards, but had 72 on the ground. Green-Ellis had just 18 yards on 10 carries. Cincinnati ranks 17th in the NFL in rushing, gaining 96.7 yards per game. Benson is likely to get plenty of carries, but if the Bills force Dalton to beat them by himself, Benson could see plenty of eight or nine-man fronts which could make running room hard to come by. Bills offensive line vs. Bengals defensive line. One of the biggest surprises (and reasons) behind the Bills’ early season success has been the offensive line. Thought of as the biggest area of weakness, the unit has relished the “getting no respect” role. Buffalo’s offensive line has surrendered just one sack to Kansas City’s Tamba Hali. They proved to be more than up to the challenge against a bigger, physical Oakland front seven and New England never really came close to threatening Fitzpatrick. The Bengals have nine sacks already this season and will likely dial up the pressure another notch against the Bills and Fitzpatrick. Given the way he’s performed through three games, allowing Fitzpatrick time and a clean pocket to step up, complete passes and make big plays has been a reipe for disaster. 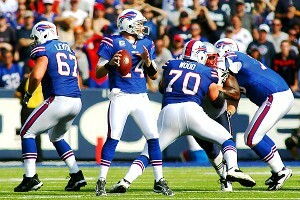 Think the Bengals D will put more pressure on Fitzpatrick, but for me the Bills will be to strong and 4-0 !